With its emphasis on driving refinement, sophisticated styling and high quality materials HSV’s new Y Series is aimed squarely at beating the premium imported brands at their own game. From owner surveys HSV knows that many customers also consider prestige European models when buying their HSV. In fact last year 25% of HSV customers indicated that they considered a BMW as their first alternative choice. Those statistics set the tempo for Y Series, says HSV General Manager, Chris Payne. "We deliberately set out to refine our suspensions, powertrain calibrations and braking system upgrades to lift the level of refinement to meet that European expectation. We also aimed for some very high benchmarks in terms of material quality and design." Applying a new, more structured format to the Y Series development program ensured that it met all timing and quality objectives. The result ushers in a new era of sophistication that’s clear to see in the suave interior and exterior styling and high quality materials, including polypropylene full injection moulded body components and premium fabrics and leathers. That mark of sophistication is also evident from behind the wheel. A 12 month drivetrain recalibration program has smoothed and refined the performance delivery of HSV’s 300kW C4B V8 and the HSV enhanced LS1 V8, while also increasing maximum power on the latter engine to 260kW. An upgraded and recalibrated automatic transmission completes the revised package. These refinements, coupled with new steering components and suspension tune featuring a digressive shock absorber rate, ensures that every Y Series model imparts a smooth, premium European-like driving experience. Seven distinctive models make up the Y Series range which heralds the return of an old favourite -Senator. It effectively creates a second level of HSV Grand Touring performance sedan, bridging the gap between the overtly sporty ClubSport R8 and the even more highly specified Signature model. In time to commemorate the 30th anniversary of the GTS sedan, HSV’s legendary GTS four-door is back in limited numbers - only 100 of these awesome performance sedans will be built. The exclusive HSV specified 300kW C4B V8 engine still resides under the hood but thanks to significant recalibrations it’s now smoother and offers more bottom end and mid range performance. Customers have long requested the convenience of automatic transmission coupled with the awesome 300kW C4B V8 and, now, Y Series GTS sedan becomes the first HSV to offer this sought after option. It’s been made possible by the availability of a new ’torque enhanced’ version of the Turbo-Hydramatic 4L60E four-speed auto capable of handling the massive torque of this legendary powerplant. So good is the new engine/transmission combination that it easily passed extensive HSV durability and towing tests. HSV’s tremendous reputation for braking performance can only be further enhanced by the major upgrades to every Y Series model. The previously optional HSV Performance Braking System is now standard on ClubSport, Maloo and Senator. This PBR developed system features grooved 330mm front and 315mm rear rotors and is the same generation fitted to Corvette C5 models in the US. Befitting HSV’s most powerful model, the GTS sedan comes with one of the most powerful braking systems fitted to any production car in the world today - the HSV Six-Piston Braking System. This race-bred system (shared with its HSV Coupé namesake) was developed in conjunction with AP Racing in the UK and sports six-piston front and four-piston rear callipers acting on 362mm front and 343mm rear cross-drilled and grooved rotors. Highlighting their impressive capabilities, every Y Series braking system features clearly visible HRT Red painted callipers with HSV logos. Clean, sophisticated styling sets the tone for the Y Series range. It’s the work of a team headed by Neil Simpson, Chief Designer at TWR (UK). "Using design cues with the previous GTS and the Coupé, I wanted to build on the HSV image with an even more muscular yet sophisticated package." "An important design aspect was to create more significant differentiation between the GTS and the Senator body styles. The GTS is a powerful looking machine, whilst the Senator makes a more discrete Grand Touring statement that will appeal to customers who have previously looked at only the most exclusive of European Autobahn expresses." Frontal styling has created a wider, more imposing stance highlighted by an impressive lower spoiler, says Simpson. "Inspired by a Formula 1 wing, it’s the most eye-catching feature of the design. The ’V’ forms part of the centre bar and reinforces this as the HSV signature." Side elements link the whole design and the rear continues the themes of width and the centre bar with a ’V’ in the spoiler echoes the front. "I’m particularly happy with the way the spoiler hugs the rear lamps and takes the eye down to the air outlets and onto the inset area." Maloo styling sets new standards with left and right hand side rear exiting exhaust and new sail plane and hard tonneau design for the R8. Four new colours join the range for Y Series. ’Martini Grey’, ’Turbine Grey’ and ’Berry Red’ are understated colours that work superbly with the sophisticated new styling, while the high impact, ’Hothouse Green’, is now available on ClubSport, ClubSport R8 and Maloo models. A major investment in tooling development also sees the introduction of Polypropylene body styling components on Y Series models. These state of the art components are of an Original Equipment quality standard - lighter in weight and offer improved fit and finish. The Y Series interior follows the sophisticated lead of the exterior, explains Neil Simpson. "The interior design of the Holden base vehicle has been improved considerably and with HSV’s driver oriented changes we’ve created a great sporting cockpit. The changes are concentrated on the main areas of contact and, along with the new accent colours, strikes the ideal balance of sports and luxury." 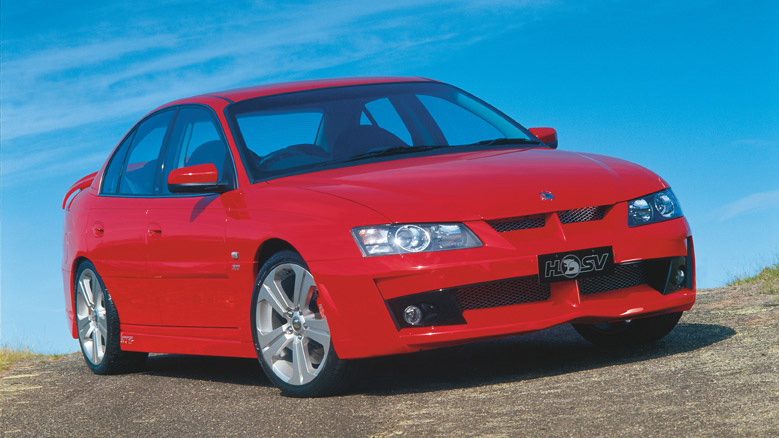 A bevy of unique HSV features ensure that sitting behind the wheel of any Y Series model is a very special occasion and also provides clear differentiation to their Holden counterparts. Highlights include a new four spoke leather bound HSV steering wheel, with sports grips and audio controls, a striking white instrument cluster, complete with 260km/h speedo, HSV graphics and an ultra-cool HSV feature incorporated into its Multi Function Display - on start up the HSV logo scrolls across, accompanied by the vehicle’s unique build number and model id. Race-look alloy pedals are fitted across the range, while manual models also receive the HSV shift light and audible alert previously restricted to GTS. The cabin’s distinctively sporting character is further emphasised by the new central sports binnacle incorporating oil pressure and volt gauges (fitted to all models except ClubSport and Maloo), says Neil Simpson. "The centre sports binnacle reinforces the fact that the interior is focused onto the driver. Take a look at any serious driving machine, particularly if it’s red and Italian, and you’ll see where we drew our inspiration." In addition to the HSV specific highlights all Y Series models include a range of big-ticket luxury/convenience features. Automatic climate control air conditioning is now standard equipment on all models, with Senator and Senator Signature models adding a dual zone function which allows individual climate settings for driver and passenger. Standard in car entertainment is now via a high output Blaupunkt unit including in-dash six-disc CD changer and six speakers. R8 sedan, Senator and Senator Signature and GTS models again up the ante with a Premium Blaupunkt 200watt system including in-dash six-disc CD changer and eight speakers with sub woofers. HSV Bosch rear proximity sensors are now standard equipment on Senator, Senator Signature and GTS sedan. Twin in-dash concealed cup holders are fitted to all models. Apart from its two-seat layout, Maloo essentially shares interior appointments with the ClubSport. In addition to the previously mentioned features, the HSV Contoured Sports Seats receive a sophisticated new ’metallic mesh-look’ centre insert material - in a choice of Aztec Red, Baltic Blue, or Stone Grey - and are finished with high definition colour keyed stitching. ClubSport R8 and Maloo R8 raise the interior comfort and appearance a notch higher. HSV Performance Seats feature the same choice of centre insert material colours but add anthracite leather bolsters and colour-keyed leather door inserts. Swathes of ’light shale’ leather trim for Senator and Senator Signature are complimented by a brushed alloy dash surround, an 8-way adjustable driver’s seat, HSV floor mats and alloy sill panels to create a truly prestigious interior ambiance. The GTS sedan’s exclusive performance status is reflected in its exclusive interior appointments. Its Contoured Performance Seats are finished in distinctive, premium quality ’Chainmail’ leather, imported from Bridge-of-Weir Leather Company, in Scotland, and are completed with anthracite leather bolsters and colour keyed leather door inserts. A carbon fibre style dash surround, alloy sill panels, HSV floor mats and parking sensor assist complete the luxury/high performance picture. Crisp styling, a high quality interior package and additional performance enhancements ensure that ClubSport is an outstanding value for money, performance buy. With a unique blend of luxury and performance equipment ClubSport R8 is once again set to take its place as HSV’s most popular model. Maloo and Maloo R8 now boast levels of comfort, quality and performance previously unheard of in this type of vehicle - no wonder they’re regarded as the ultimate expression of the great Aussie sports Ute. With the return of Senator to join Senator Signature, HSV offers two distinctive levels of premium Grand Touring sedan. In terms of luxury appointments, style, quality and refinement they are the equal of any alternative on the market. When performance and value for money are also taken into account there is NO comparison. By adding newfound refinement and quality to its prodigious performance talents, Y Series GTS sedan is again arguably the finest sporting sedan in the world and the option of automatic transmission simply broadens its appeal. The limited build status of the GTS sedan means only 100 units of this model series will ever be sold. As a model range, Y Series is set to make life very difficult for European competitors, says Chris Payne. "Many of our customers are attracted by a wide selection of European cars that generally offer good dynamics and refinement. That expectation drives us to lift the bar in all aspects of the HSV brand." "Where else can you buy a large four door sedan with 300kW and automatic transmission and, if you can find one, how much does it cost? People tend to forget that HSV models are often compared with much more expensive vehicles, and now with Y Series we’re clearly on a par." "We have tremendous performance, luxury features and value advantages in a uniquely Australian package and that’s even further enhanced with refinements to Y Series."